If you asked my step-dad what I got him for Christmas last year he would tell you coffee. And if you asked him what he thought I was going to get him this year again he would say coffee. It may sound like a strange gift, but that's what I get him every year coffee, and sometimes a new mug to go with it. It started out as me not knowing what to get a man that already has everything, and then somehow became a tradition that we both looked forward to. For a man that drinks coffee 365 days a year there's honestly not a more fitting gift. This year to change it up a little I'm actually giving him not just that coffee and a new mug, but also a fancy new coffee pot. The one he's been using has taken on a mind of it's own and changes the time all by itself. That makes it a little rough when you plan on your first cup every morning at the same time. Or at least that's what I've been hearing lately from my mom. 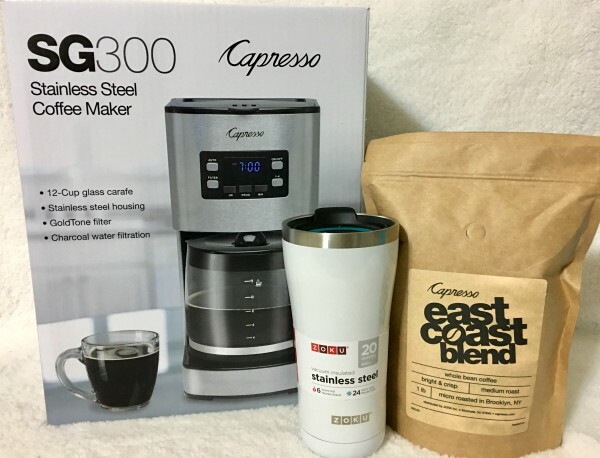 Capresso has a really nice 12-Cup Stainless Steel Coffee Maker that has the digital display and the ability to program it for brewing while you sleep. Definitely a step up from his current coffee maker. I'm pairing it up with a bag of Capresso East Coast Blend coffee beans since he likes his coffee fresh. And since we celebrate on Christmas Eve he will be able to enjoy it in his new 3-in-1 Stainless Steel Tumbler Christmas morning. With it's ability to keep beverages hot for up to six hours he will be able to enjoy a nice big cup that lasts all morning long.